ST. PETERSBURG — The city is crafting a new vision for the 86 acres that surround Tropicana Field. Step one: Don’t call it the Trop anymore. City officials and planners behind the massive redevelopment want to move beyond the baseball dome and reconnect with the area’s history. That’s why the project has been dubbed — for now — as the Gas Plant District, said Randall Morton, design principal with HKS Architects. The name change harkens back to the African-American neighborhood the city bulldozed decades ago to build the then-Florida Suncoast Dome, which opened in 1990. Morton said the name could change again later. His New York firm, HKS Architects, is charged with drafting a master plan for the site with and without a baseball stadium, depending on whether the Tampa Bay Rays stay or move to downtown Tampa. The master plan with a new stadium has been completed. Now the firm is designing a plan without a home for the Rays. Morton and Alan DeLisle, the city’s development administrator, stressed to a crowd of more than 200 who gathered Monday evening at the University of South Florida St. Petersburg’s campus that there’s still time for residents to have their say before the final plan is assembled. 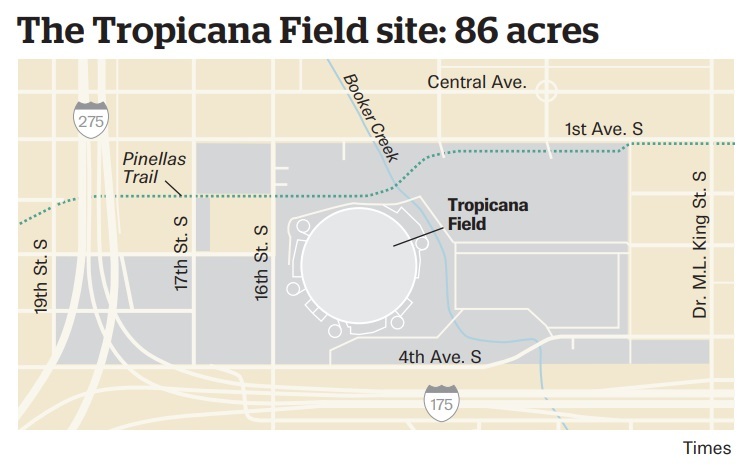 The 45-minute presentation revealed a vision of what the valuable property west of the downtown waterfront could look like when the Trop is torn down after the Rays’ contract to play there expires in 2027. Another big idea that was revealed Monday: Build a convention center there. Tampa has its own convention center, and thus attracts all the convention business in the bay area. However, there is no such meeting space in Pinellas County. But in the Gas Light District plan, the redevelopment could see a convention center built that would be tied into a tech-oriented campus, perhaps for USFSP. Think labs and classes, but also a performance hall for lectures, art and maybe even concerts and sporting events. St. Petersburg City Council member Gina Driscoll said the lack of a convention center has long been a void in Pinellas and St. Petersburg in particular. She also liked the idea of tying it to a college campus dedicated to technology. About 40 percent of the Gas Plant site, or 34 acres, would be set aside for public space, including parks and a pedestrian promenade, Morton said. The other 60 percent would be used for the proposed convention center and the businesses, housing, retail and entertainment that will take root there. Planners also proposed taking Booker Creek, which winds through the site and is 30 feet across at its widest point, and expanding it to as much as 300 feet of wide at certain points. That would create a water feature for the new district which would be surrounded by terraces, sidewalk cafes and retail, as well as creative lighting and public art. “Booker Creek is going to become, really, one of the centerpieces of the community,” Morton said. While Booker Creek could become a north-south draw for tourists and shoppers, a proposed pedestrian promenade would offer a similar draw running east-west through the district, with retail options and a community-vibe. Other aspects of the Gas Plant plan include adding a variety of housing options, DeLisle said, especially affordable housing to address one of the region’s most pressing needs. The goal is for new housing to hit on all sizes and price points. 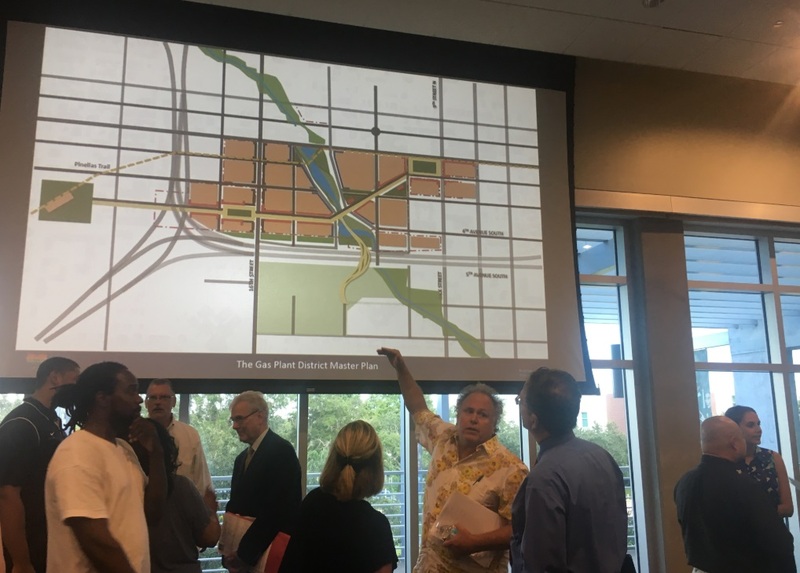 Another idea that connected with Monday night’s crowd was the potential of reconnecting the St. Petersburg neighborhoods divided from the rest of the city by Interstate 175. Right now, I-175 splits off from I-275 and has created a concrete barrier dividing neighborhoods such as Campbell Park south of the Trop from the economic development surrounding the dome. “The success of the Gas Plant Site is going to be directly connected to reconnecting some of these communities that have been separated,” Morton said. Monday’s full presentation will be posted to the city’s website Tuesday morning, staff said. 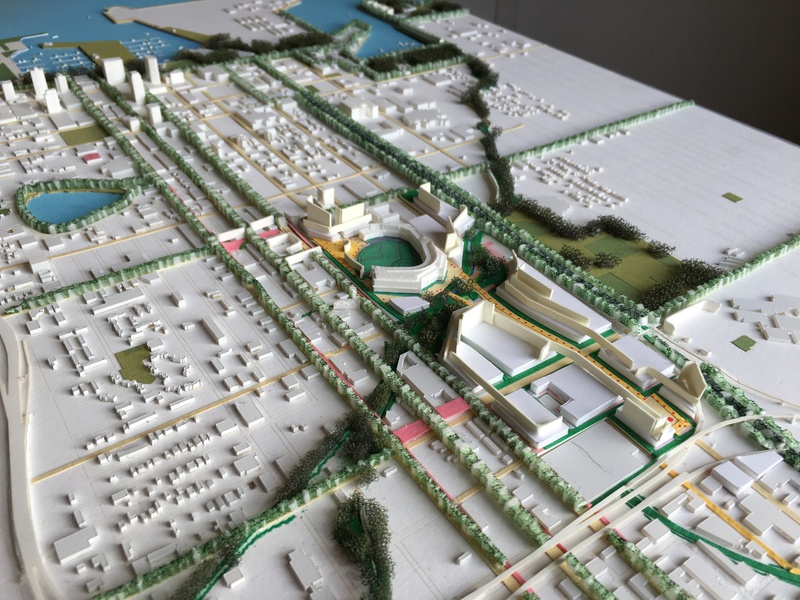 DeLisle said the city is “on a fast-track with this planning process” because it had already gathered plenty of public input in drafting the plan that includes a baseball stadium. The city expects to have fewer community outreach meetings during this planning round, but looks to hold meetings with smaller group over the next two months. Staff and HKS Architects will present a more complete master plan for the site to city council in October, DeLisle said.